This product is a G2A Gift Card €20 valued, so you simply need to redeem the code in your G2A store account to instantly purchase €20 on your balance. With these 20€ you can buy without any commission or fees, any game on G2A store exceeding that amount. First, you must create an account in the store and loging in G2A to access your panel. 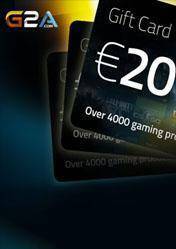 Second, you must enter the code G2A Gift Card in the "G2A Wallet" section to add this amount in your account . To purchase any product in the store with your G2A Wallet, you should select as payment "G2A Pay" and select G2A Wallet payment format. Remember that you can choose from more than 5000 games to use your Gift Card. such price drop very wow! Cool Tech Under $50 - June!